Shadows from late winter sun. I make a lot of trips to this garden. I have a membership and believe in this little place in every way. It’s a great place to go whenever you need to shake the clouds from your head. 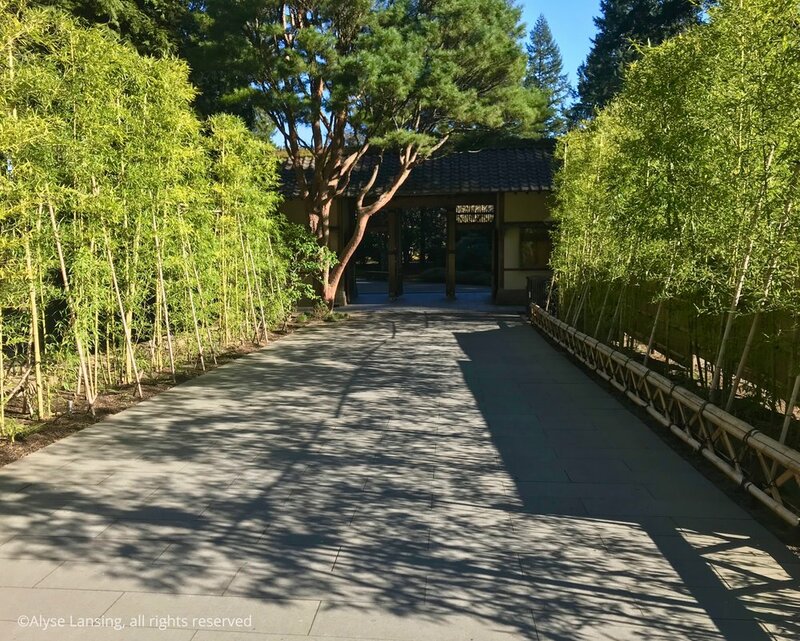 Form and line, at the entrance to the Japanese Garden. One morning recently, with a couple free hours between appointments, I had a spontaneous opportunity to stroll the Portland Japanese Garden. The weather could not have been better, so I seized the time I had, and hopped on up there. From the south waterfront OHSU, where I’d just finished a doctor’s appointment, it was a quick drive up the back streets past the MAC club and the old Civic Stadium, past the Rose Test Gardens, to my arrival at the garden in Washington Park, on Kingston Street. Except for the south waterfront, this drive has not changed much in the 50 years since my youth. It’s old Portland to me, and steeped in memories. This put me in a warm and expectant mood. Light streamed through the tall Douglas Firs behind the entrance. I lingered at the entrance a bit, as it was a weekday morning in March, one of the least crowded times I’ve experienced since the garden’s 2017 expansion. I took the chance to photograph the entrance, which usually has too many people around to capture easily. 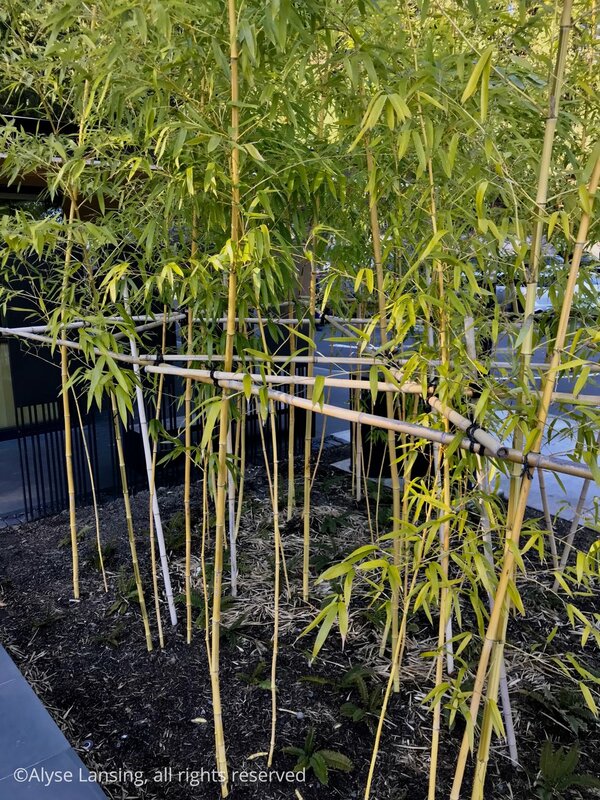 I admire the bamboo staking in this garden, artistically and subtly executed. They situate the horizontal pieces exactly at the average person’s eye level, so that most of the gridwork that could distract the eye is “hidden.” I had to stand up on the water feature ledge to get this photo, and even then, it was hard to distinguish the lashing and how it’s done. I love the cleverness, and the thought that was obviously put behind that detail. Craftsmanship in black screens and curbstones--more examples of the attention to detail. From the entrance, I continued up the hill to the new Cultural Village complex. This path is a little longer, relative to the rest of the garden, but is good for stretching legs and working out the kinks. It’s the section to shake off the city and spend a moment in the trees, traveling through. When you arrive at the top, the space opens out to the Cultural Village courtyard. I spent a few moments in the gift shop and gallery, then stepped outside and started to notice the shadows. Cultural Village terrace, facing south. 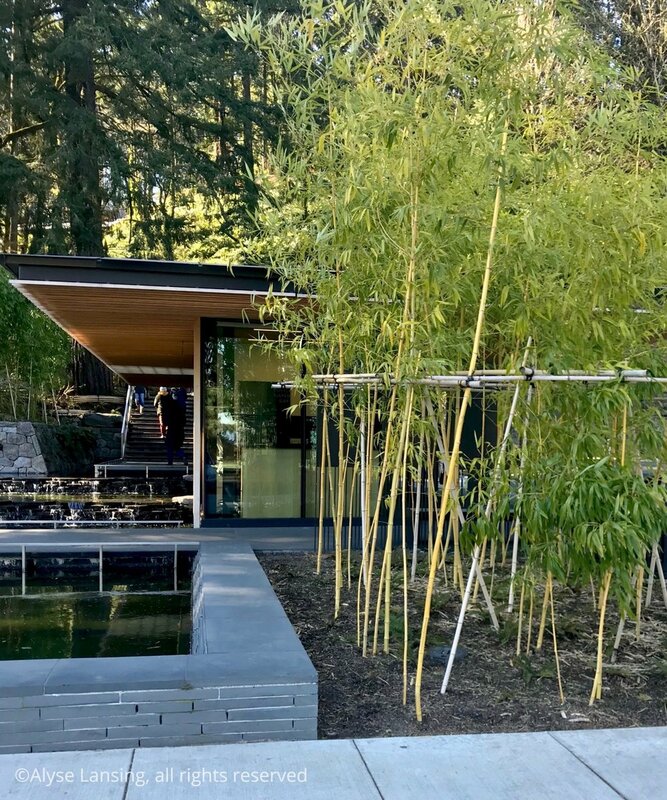 Since I didn’t take photos of the building this day, I’ll include some from two years ago, taken on April 1, 2017, opening day of the garden’s Cultural Village expansion. I’m including them so you can see the context of where I was standing in the photo above, just outside the gift shop. Gift shop is straight ahead. 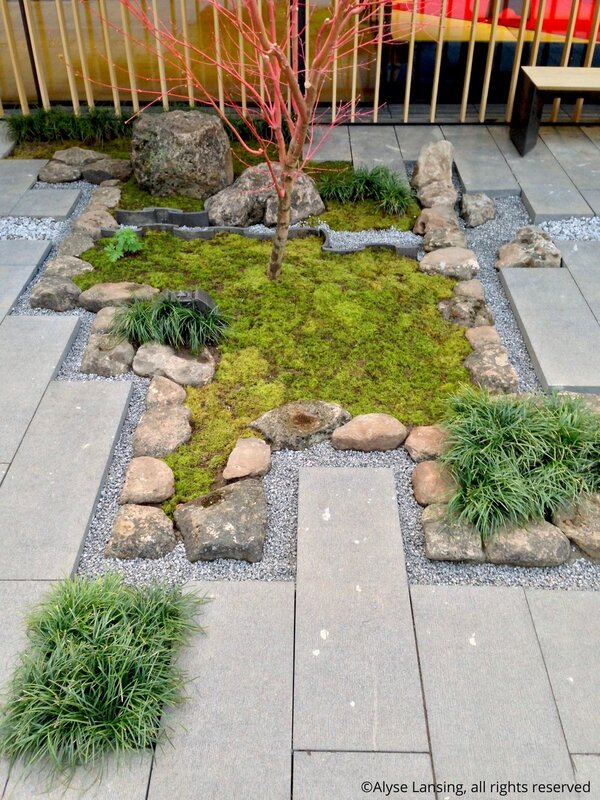 Note the cut-outs in the pavers, where granite gravel is placed. (These cut-outs are driplines—alternative to gutters on the roof.) This is the cut-out seen in previous photo. When I first saw this little space, I was blown away by the consideration put into every square inch. After passing through the courtyard, one enters the gate to the original garden. The long shadows continued to catch my attention, as the sun is only this low here in the winter—shadow patterns I don’t usually see. Main garden gate is straight ahead—the old admissions booth. Note the finely pruned red-barked pine. It may be cliche, but it certainly draws me forward! Beautiful bark, and the ground plane, which, characteristically, is elevated with detail. 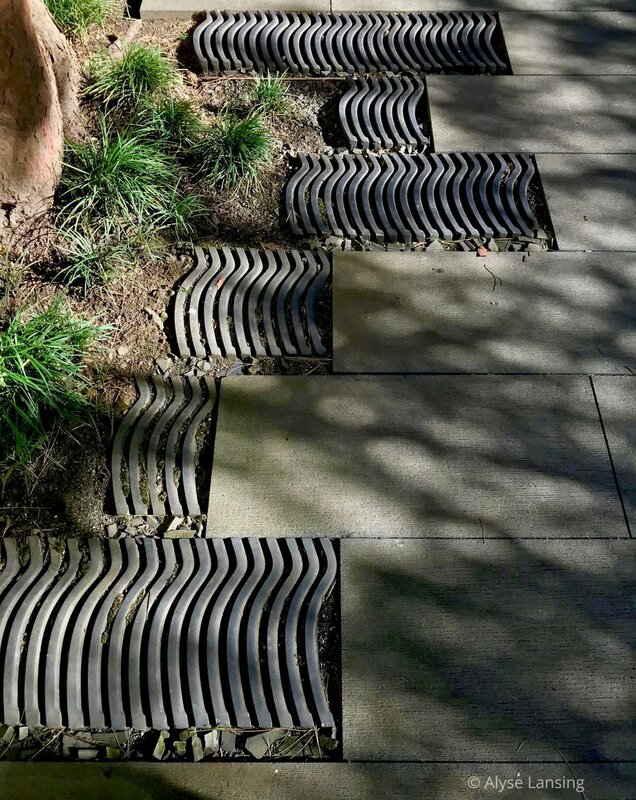 Such paving detail here also elevates the pine. It could be a Japanese Red Pine (Pinus densiflora), but I believe it’s a cultivar of Scots Pine (Pinus sylvestris). Do give a shout in the comments if you know it. ...It's one of my favorite trees in the garden. I looped through the Pond and Strolling Gardens, but they were less photogenic this day (or this time of year, to be honest), being cast in the shadow of the hill. Then I stepped out into the Flat Garden, blessed by sunlight. I was again struck by the shadows...and how bright the sun was upon the moss. 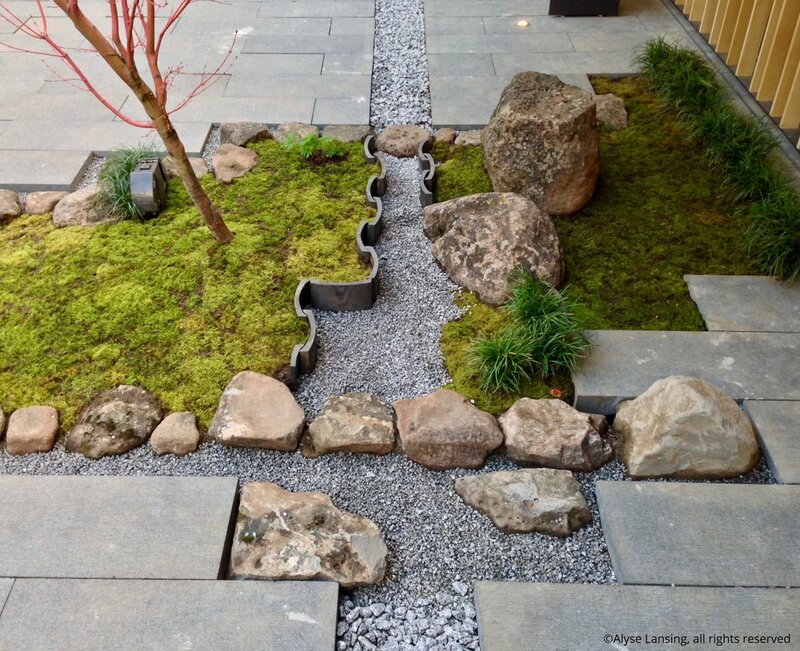 The Flat Garden is a broad expanse of space, and its raked gravel is designed to mimic a lake, or to emulate a sea in miniature. The pavillion porch perfectly frames the view. One could sit on this veranda for hours. And that may be entirely the point. Design tip: one of nature’s most valuable beauty tricks, to use in any architecture placement or garden design: back lighting. ...when it can be cast in black & white, and be just as fantastic. This garden is as fine as a painting. Thanks for letting me share this time with you. There is a lot more to the garden, I only focused on a couple pieces of it here today. Please leave a comment below if you feel so moved. I love to read them. Travel Tip— For drivers: load the Parking Kitty app before you go. Use it to park at the Japanese Garden, or anywhere in Washington Park. It’s not necessary, but is very handy.